San Diego County will be met with days of rain and the possibility of snow as storm after storm moves into the region starting Thursday. The first of three storm systems moved south into San Diego County Thursday afternoon, wetting grounds for the evening commute and dumping more than an inch of rain in some communities before the day was through. A Flood Advisory, which warns of small stream and urban creek overflows, was in place until 7:30 p.m.
NBC 7 Meteorologist Dagmar Midcap said heavy to moderate rains gave way around 5 p.m. to consistent light showers that would last until 9 or 10 p.m. in the south and southeast corner of the county. "Even though you’re going to leave the house [Thursday] morning and it will be dry, take the umbrella because you’ll need it later in the day," Sheena Parveen said in NBC 7's First Alert Forecast. By 8 p.m., La Mesa, Lemon Grove and Santee had received over an inch of rain, and Oceanside, Bonsall and Santee saw just under an inch. More than three-quarters of an inch fell in San Marcos, Carlsbad, and Encinitas. A warning was issued from 1:15 p.m. to 2:15 p.m. for San Diego International Airport suggesting the possibility of cloud to ground lightning. 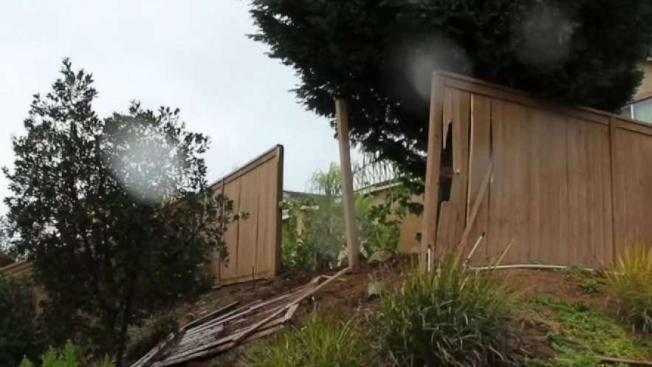 In Ocean Beach, a large tree toppled to the ground narrowly missing a home. The near 20-foot tree fell near Del Monte Avenue and Sunset Cliffs Boulevard. City crews were out in the dark cutting the tree into pieces and loading it into a trailer with a tractor. "It just happened and anybody could've been walking by," a nearby homeowner said. "Frequently there's people on sunset cliffs with their pets or their children." Crews told NBC 7 it was the fifth downed tree they've responded to Thursday evening alone. In San Marcos, residents had a close call when lightning struck a tree in their backyard causing an explosion and a fire. They heard a loud boom when the lightning struck, and according to firefighters, the energy traveled down toward the ground and through a sprinkler system which caught on fire. The explosion caused damage to the fence surrounding the property and the surge damaged wiring leading to the home. The residents told NBC 7 they could be without power for a few days. In El Cajon, a flatbed tow truck lost control on the roadway and drive into a drainage ravine with a swift current. Another truck had to come and attached chains to the crashed truck and pull it out. Luckily, no one was hurt. NBC 7's Brittany Ford reports. The NWS issued a special beach hazard statement advising San Diegans that a storm moving into San Diego County may result in lightning at the beaches around 2 p.m. The County Department of Environmental Health issued a General Rain Advisory at all coastal beaches and bays due to urban runoff. Surfing, swimming and other water contact activities should be avoided for 72 hours after rainfall, the county said. Skies will clear for a day of dry but gray conditions on Friday. Then, a stronger storm moves in over the weekend, Parveen said. Heavier and more widespread showers will begin overnight Saturday and last throughout the day, even lingering into Sunday, Parveen said. The system could dump more than an inch of rain onto San Diego. The storm may also bring some snow to mountains ranges with elevations higher than 5,500 feet, though Parveen said it is likely San Diego mountain ranges will see a wintery mix of rain and snow. Can San Diego Soil Handle 3 Storms? 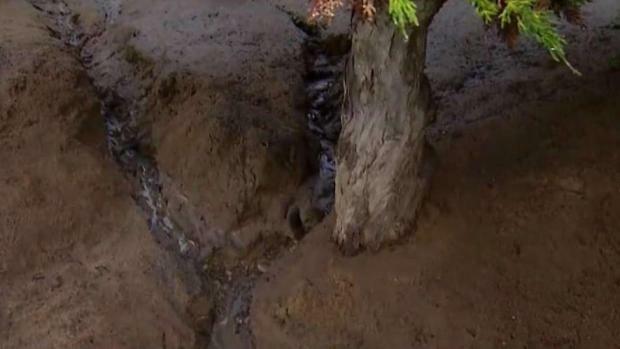 NBC 7's Llarisa Abreu talks to a soil expert about soil qualities that help, or hurt, when heavy rains come. It is likely that a third storm will bring more showers early next week, Parveen said. In total, all storms combined could bring several inches of rain to parts of the county.